What is Poisonous To Dogs? 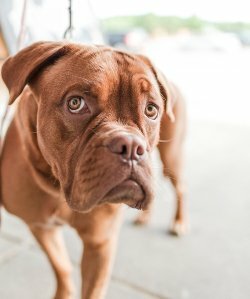 Some stuff that's poisonous to dogs is fairly obvious, but there's are also many everyday things that you may have no idea could hurt your dog. 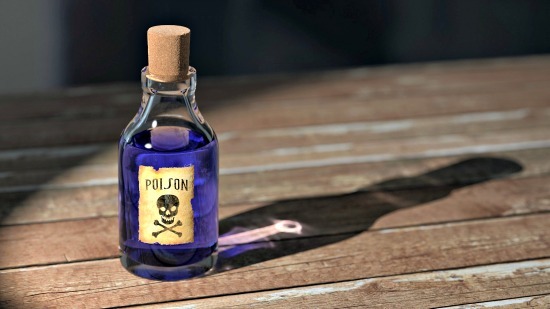 If it was as easy as a bottle labeled 'Poison' it would be much easier to keep your dog safe! Unexpectedly toxic items which could poison your dog includes common food items, medications and vitamins, flowers and plants, cleaning products and other items that you probably wouldn't think twice about - unless you were aware of their dangers. Puppies in particular are notorious for getting into things they shouldn't, and they tend to operate on the assumption that everything is edible until proven otherwise. If your little guy thinks it's perfectly okay to eat that cardboard box, he won't think twice about snacking on anything that you leave lying around! So, keep Fido safe by making sure he never gets a chance to eat (or drink) any of the dog poisonous items on this page. Use these Quick Links to jump directly to the category you're most interested in or simply scroll through to see the full article. Dogs can sometimes act as though they're four-legged trash cans, happy to eat leftovers, scraps, tidbits and anything anyone cares to toss their way. Unfortunately for Fido he doesn't know that some foods that his human family enjoys are toxic to him. Even more dangerous is that many times we humans are also totally unaware of the doggie danger lurking on our plates or in our pockets. Although the regular flesh of apples isn't considered dangerous, the leaves/stems/pips or seeds of apples and apple trees are all toxic to dogs. When ingested chemicals in them are converted to Cyanide, a very dangerous poison. In Fall, the chemicals in the leaves/stems/seeds is in it's most concentrated form, making fallen leaves even more deadly. Hard candies of all sorts are the ones most likely to contain Xylitol, but other candies and gum (even sugarless gum) can also have Xylitol as an ingredient. Chocolate contains large amounts of natural stimulants called Methylxantines. The darker the chocolate the higher the concentration of these compounds and the more danger to your dog. Even white chocolate can cause problems. Cocoa powder has similar dangers and cocoa beans are extremely toxic. It's important to be especially careful during holidays such as Easter, Halloween and Christmas, when lots of chocolate and candy is in your home. You can learn more about what happens when a dog eats chocolate and what to do to keep him safe on my Help - My Dog Ate Chocolate! page. The peel, pith and seeds of citrus fruits (oranges, lemons, limes.) can cause irritation to your dog's digestive system, especially if eaten in large quantities. Grapefruit has the potential to actually be toxic to your dog. If your dog ingests grapefruit have him examined by a veterinarian right away so that you can make sure that he is safe. These can be dangerous to your dog and cause a bad reaction if ingested. Mushrooms can be poisonous to dogs. Macadamia nuts are surprisingly toxic to dogs. They can cause temporarily paralysis - which is obviously very dangerous. Food which has turned moldy or rotten is toxic and dangerous for dogs, just as it is for humans and other animals. It is NOT safe to feed dogs food which has 'gone off' or is moldy/turning bad. Onions and garlic contain a toxin called Thiosulphate. Thiosulphate affects the red blood cells in your pup's body. Garlic is more dangerous than onions, approximately 3 - 6 times more dangerous. Toxicity levels for onions is 0.5% of a dogs body-weight, or approx 15/30mg per kg of body weight. For garlic it is 5mg per kg of body-weight. In general it's best to just avoid giving you dog ANY amount of onions or garlic. Yes, you read that right... peanut butter! BUT not all peanut butter, just some of them. This is a new development because recently SOME manufacturers have started adding Xylitol (see above) to their recipes. So, always check the ingredient list on your jar of peanut butter closely if your pet is going to be sharing your peanut butter. This may sound like an odd addition to a dog poisonous food list, but it's really pretty obvious once you think about it. If uncooked dough expands inside your pups tummy it can cause internal damage. Dogs should never drink alcohol, not even a sip of beer! Iron tablets, and vitamins which include Iron (including pre-natal vitamins) can cause serious problems for dogs, potentially even fatal ones. Other common people medications and medical preparations can be poisonous to dogs. Topical creams and ointments, nasal sprays, certain eye-drops and so on are also potentially poisonous to dogs. Cigarettes, E-cigarettes, nicotine patches and nicotine gum are all highly toxic to dogs and can kill Fido very quickly. Symptoms (or even death) can occur in as little as one hour! If treated quickly a dog can often be saved or the damage reversed, but there is NO TIME to wait and see. If you think Fido may have ingested nicotine in ANY form, get him to your vet or an emergency vet immediately. 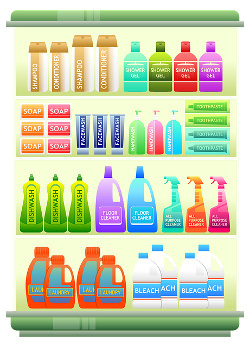 Most homes are filled with a host of chemical-based products which can be toxic to our dogs if ingested. It could be something as obvious as an insecticide or pesticide, or as seemingly innocuous as laundry detergent or fabric softener sheets. To make matters worse, many cleaning stuffs are kept in low cupboards, garages, back yards and other places where it's fairly easy for Fido to get to them. Making sure to correct this is an important part of puppy proofing your home and keeping your dog safe. The average home contains a variety of different cleaning products, some of which can cause real problems if ingested by your puppy or dog. If your dog eats/licks up any of the following products it's important to call a Poison Hotline (click here for number) or a veterinarian IMMEDIATELY (call a 24 hour pet hospital if it's after hours) and follow their advice. The symptoms your dog might experience from poisoning by these types of products vary depending upon the individual chemicals they contain. Chemicals used for swimming pools, lawn and plant care, pest control and automotive repair or maintenance products are all extremely dangerous and poisonous to dogs. Then there are the random everyday items that can harm our dogs. Please do NOT take a 'wait-and-see' approach if you even THINK your dog has ingested a dangerous item or substance. 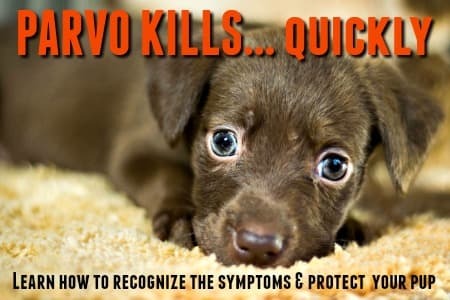 Symptoms may not show up right away and if you wait it could cost your dog his life. Many plants are toxic to dogs, effects can range from mild topical irritation to skin and/or mucus membranes (mouth, tongue, eyes etc.) to serious, potentially deadly, reactions. Just one, or multiple, parts of a plant or tree can be dangerous, including bulbs, flowers, seeds, bark, stems and more. The ASPCA website has a very comprehensive list of plants which are toxic to dogs (you can also search for those toxic to cats or horses). It's worth bookmarking so you can find it easily if you need to. With a lot of the above poisonous foods and toxins it doesn't take very much to make your dog seriously ill. ALWAYS, ALWAYS SEEK VETERINARY ADVICE if you even just think your puppy or dog has ingested dangerous or poisonous foods. Every minute counts in these situations! If your pet has only ingested a small amount of one of these poisonous foods and is experiencing some vomiting, diarrhea or other fairly mild symptoms, you may be inclined to think that everything is okay. BUT you should always get veterinary help, or check with your local poison control center, because the real damage may not show up right away. 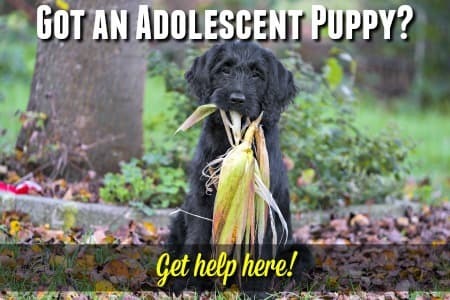 In some cases symptoms gradually worsen over a period of hours, or even days, and if you 'wait and see' it could be too late for your precious puppy by the time you seek help. The ASPCA Animal Poison Control Center number is 1-888-426-4435 or 1-800-548-2423. Being prepared can make all the difference in an emergency situation. I'd also suggest visiting my Dog Poisoning page to learn more about common household items that are toxic to dogs, and what to do if you suspect Fido has ingested something dangerous.